What’s with the Creepy Heads? 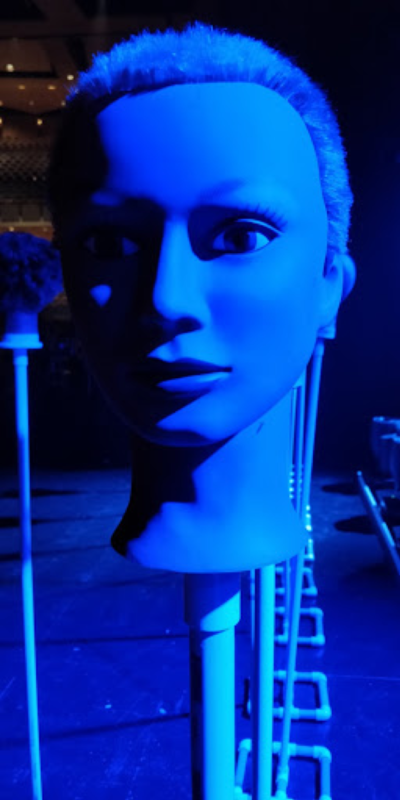 Anyone who has been on the Willow stage will likely recognize the sight of mannequin heads on sticks scattered haphazardly across the stage. One of the questions I answer most frequently when giving tours at Willow is “What’s with the creepy heads?” Before I answer that question let’s first talk about what the heads are. They are retired beauty school mannequin heads who have no more hair to offer and are now set on top of either a mic stand or a PVC pipe structure. We give them a loving home on the stage and put them to work standing in for singers and actors for lighting focus. These creepy heads are our steadfast lighting partners holding down a spike mark patiently waiting for their moment to shine. They don’t need coffee breaks, they aren’t afraid of the dark, and they rarely wander off. They allow our lighting designers to dial in front and backlight without needing our stagehands or artists to stand around while they do it. Because they are made to mimic a human face they also work great to see what the light looks like on camera. So to sum up what could have probably been a single sentence answer to your question: They are stand-ins for our artists when they can’t be in place, allowing our lighting team to continue to work while they are away. I was told you can’t make a blog post out of a single sentence so think of everything else contained in this post as the bonus you never asked for and you aren’t sure you really wanted. FAQ: What system do you use for tracking broken equipment?